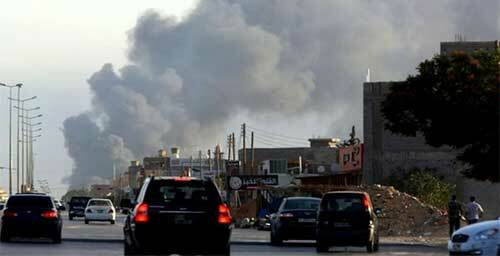 Libyan eastern-based army air force on Saturday attacked terrorist sites in the eastern city of Derna. “The air force targeted sites and observatories of terrorist groups in Bukhtal farms in southern Derna.” Media office of the Libyan army’s Omar al-Mukhtar unit said in a statement. The air strikes destroyed positions and armed vehicles of militants, the statement revealed. The coastal city of Derna is the only eastern Libyan city outside the control of the army. Derna is under control of a coalition of extremist militias called the Shura Council of the Mujahideen of Derna. The coalition does not recognize any of governments rule. The army, led by General Khalifa Haftar, have been imposing a land and sea blockade on Derna since mid-2015 and allows residents to enter and exit for humanitarian and medical reasons only.